Always fin to look at of course. I see some green here, St Patrick's Day? I got some good shots of her too. But not the man in the background. Funny! She seems to be causing quite a bit of hoopla in Jackson. Reminds me of a song by Johnny Cash! Maybe she's in training to be a belly dancer? 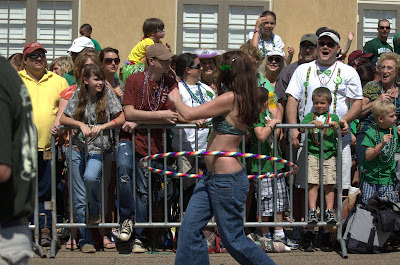 I tried the hula hoop thing a couple of years ago, but darn near fell on my you-know-what. Lois Anne got really good - could do something like 600 twirls at a time! Living and loving in Berlin!